Tis the season for spending time with family and loved ones. Whether you’re celebrating the holidays or just spending quality time together, it’s often hard to find something to do that everyone will enjoy. Studies have shown that there are many benefits for seniors who participate in activities with children, including burning more calories, fewer falls and better memory performance. Older adults with dementia have experienced more positive effects during interactions with children than when participating in non-intergenerational activities. You can learn a lot from your loved one, but you can teach your loved one something too. Here are a few ideas to get you started. Winter is upon us, and Mother Nature has not been especially kind this year. With subzero temperatures, harsh wind chills and a constant stream of snowfall, it is important to make sure your older loved one is protected from the elements. When we hear weather described as “treacherous,” images of blizzards or hurricanes usually come to mind. But sunny summertime can also bring hazards. According to the Centers for Disease Control and Prevention, more people die from extreme heat than from other weather conditions. Everyone should get his or her house in shape for winter, especially your loved ones who are older adults. Living in areas where the temperature is below freezing and there are snowstorms frequently can be dangerous for older adults. You can help your loved one by spending a few good hours to help her winterize her home. Enjoy the Holiday Season While Caring for Your Loved One with Alzheimer’s disease. “Tis the Season” will ring through your homes very soon! Tis the time of gathering with family and friends—a time that can also be stressful, particularly, if you are caring for a loved one with Alzheimer’s. This summer's heat wave is especially difficult for older adults. Elderly bodies don't adjust as well to temperature changes as they did when they were younger. Certain diseases and medications may affect your parent's sensitivity to heat and ability to regulate body temperature. Aging bodies don't produce enough perspiration to keep an older person cool when the weather gets hot and he or she may be at risk for serious heat-related conditions. Understanding the effects of hot weather on older people can help caregivers stay older relatives stay cool and comfortable during a heat wave. For most people a long hot spell is just uncomfortable. Heat waves can be more serious for elderly people. 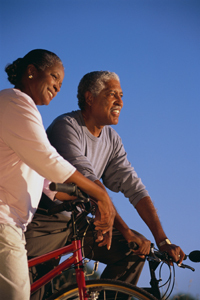 Older adults perspire less than younger people. Without perspiration body temperatures rise quickly, posing a threat to the older person's comfort and health. Chronic diseases -- diabetes, high blood pressure or overweight -- interfere with the body's normal cooling processes. Certain medications like diuretics ("water pills"), tranquilizers, heart or blood pressure drugs reduce the amount of perspiration -- the body's natural coolant -- produces.